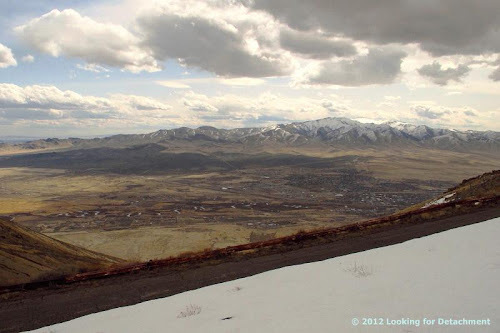 MOH and I drove to the top of Winnemucca Mountain during my first work break last month to check out the road to the top and the potential for bicycle riding up and then down (good potential: we met at least one cyclist on our way up). It was cold, wintry and windy, so I barely got out of the truck at the top, and just walked over to two edges of the mountain to take a couple pictures. 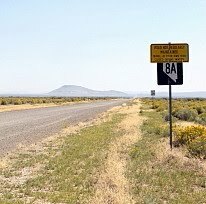 Orientations in the Winnemucca area seem a little crazy because the town runs from the SSW to the NNE, and because I am in the habit of thinking of it as an east-west-oriented town. 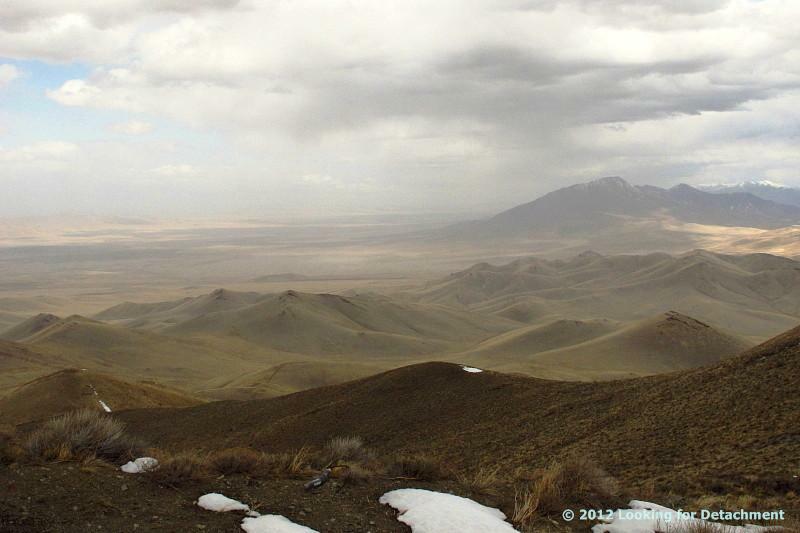 Nevertheless, in the first photo we are looking mostly to the southeast toward the north part of the Sonoma Range. Sonoma Peak, at 9396 ft (2864 m), is the highest peak in view. Large meanders of the Humboldt River, with the river running to the south-southwest toward Rye Patch Reservoir (left to right), can be seen in the flats below us. This view is to the north, with the low hills in the foreground being part of the Krum Hills. That's the Bloody Run Hills and Bloody Run Peak behind the low hills on the right, and the high, snow-capped Santa Rosa Peak in the Santa Rosa Range off in the distance to the far right. The Bloody Run Hills are considered part of the Santa Rosa Range, although they are a somewhat separate tectonic block. Silver State Valley is the flat area off to the left. The parabolic sand dunes north of Winnemucca cross through a low area between the Krum Hills and the Bloody Run Hills. You can see a bit of this large dune field in the photo, most notably a boomerang shaped portion of the field just below Bloody Run Peak (compare my photo with this air photo from MSRMaps). Davis, J.O., 1990, Giant meanders on the Humboldt River near Rye Patch Nevada due to catastrophic flooding: Geological Society of America Abstracts with Programs, v. 22, no. 7, p. A309. Trexler, D.T., and Melhorn, W.N., 1986, Singing and booming land dunes of California and Nevada: California Geology, v. 39, no. 7, p. 147-152.
cool to see the Sonoma Range! I was reading about the Sonoma Orogeny just now, before I got online (in DeCourten's "Broken Land"). Good to hear some news. I'm perusing your highway posts getting ready for my trip in a few weeks. I'm going west through the south part of the state, may head back further north in mid May if I have time to dawdle. Yeah, there it is! The Sonoma Orogeny. I mostly remember the Slaven Chert, which must be in the upper plate of - maybe it's the Golconda Thrust, will have to read up on it. Keep in touch about your trip. I'm spending most of my time up here in the Wnmca area, which may be out of your way, but depending on what days off I have and whether I'm still busy moving, could possibly meet somewhere. yeah, I'll let you know for sure. and thanks for the neat sand dunes links.